Wish you had someone to stop you from doing something really stupid every time you went on tilt? Outside of a personal assistant, there hasn’t been an option – until now. Tilt Breaker is a tilt management program that will act as a bodyguard between your rage and your precious bankroll. Armed with a Rage Quit button and Auto-Break functionality, Tilt Breaker is a helpful tool for people with tilt issues at online poker tables. Many players wish they had a buddy who could forcibly remove them from the tables when monkey tilt sets in, but they all lack the will power and end up spewing off a stack or two. This can even happen at a higher limit than they are used to playing. Tilt Breaker promises to be the friend that none of us really have while at the tables. 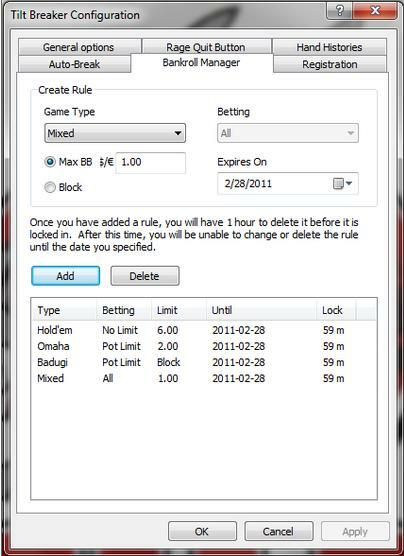 It’s a set of simple bankroll management tools designed to protect our bankrolls from ourselves. The first tool is the "Rage Quit" button. The concept is easy – when you feel like you are freaking out and full of rage, hit the "Rage Quit" button. You’ll be removed from your cash game tables and all registering and buy-in functions will be blocked. Tilt Breaker has moved to a new Smart Lock system that identifies and treats cash tables and tournament tables separately. Once a user hits an Auto-Break value, a delay timer comes up to allow active hands to finish. 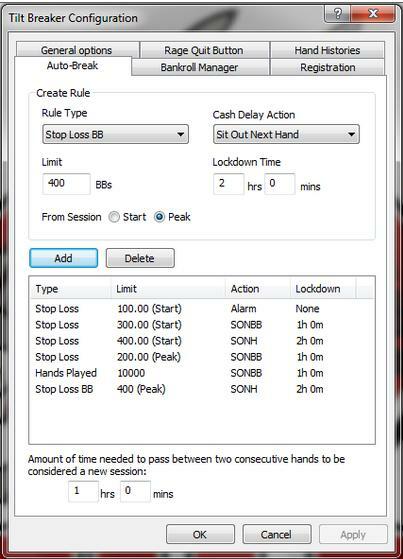 Then, "Sit Out Next Hand" is checked on all cash games and the program closes only cash tables when the timer expires. Tournaments are never interrupted; instead, the registering and buy-in functionalities are disabled. You'll never have to worry about Tilt Breaker interfering with your tournaments. There’s a free 15-day fully functioning trial version that is only a 600 KB download. The program is less than 2 MB on your computer, so it’s a very minor footprint on your system. The full version of Tilt Breaker costs $49, a pretty small price to pay compared to the times we’ve all spewed off a few stacks when we shouldn't have. If you have tilt issues, then Tilt Breaker is a great program designed to save your bankroll from the biggest villain of all – you!